A group of researchers based at universities spanning the UK, China and Spain have synthesised a diverse library of fluorescent maleimide dyes with the aim of developing a structure-function relationship, relating substituent effects to the optical properties of such molecules. This work is not only important to build upon fundamental understanding of the fluorescence mechanism, but to develop knowledge that may be used to guide the synthesis of organic fluorophores which demand particular optical properties. Organic fluorescent molecules are used as tools in many areas such as forensics, genetic analysis, DNA sequencing and biotechnology. Maleimides are commonly used as fluorescent labels for proteins, as they can couple with the thiol groups of cysteine residues. They are suited to this purpose as they are stable, easily functionalised, give strong emissions and do not perturb the protein structure to a large extent. Molecules fluoresce upon absorption of UV or visible light, elevating an electron from a ground state orbital to a higher-energy orbital and resulting in a singlet excited state. Relaxation to the ground state occurs rapidly (~ 10 ns) with concomitant emission of a photon – this is what we observe as ‘fluorescence’. The emitted photon almost always has a longer wavelength than the absorbed light, a phenomenon known as the ‘Stokes shift’. 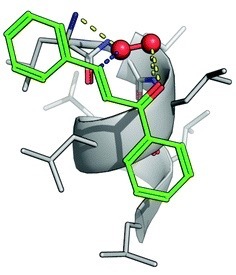 With three dihalomaleimide precursers in hand (Cl, Br and I) the researchers assembled a library of amino-halo-maleimides, amino-alkoxy-maleimides, and amino-thio-maleimides. They varied the R groups bound to the N, O and S heteroatoms to include aliphatic, phenyl and benzyl examples. The optical properties of the amino-halo-maleimides in diethyl ether were examined and the emission wavelengths were measured to be 461-487 nm, giving green-blue fluorescence. The fluorescence quantum yields, a measure of the quantity of emitted photons compared to absorbed photons and an indication of emission brightness, decreased with the electronegativity of the halide (Cl: 37%, Br: 30%, I: 8%). Like many fluorescent molecules in solution the compounds exhibited solvafluorochromism: when the polarity of the solvent alters the optical properties. In protic solvents (methanol and water) the fluorescence quantum yields decreased to below 1% and the emission wavelengths increased by 73-109 nm. On the other hand, in non-polar solvents (cyclohexane) the fluorescence quantum yield increased, up to 56% for the chloro analogue. a) The UV and emission spectra of fluorescent maleimides bearing amino (2a-c) and alkoxy (3a, 3b) substituents. b) The quantum yields of selected amino and alkoxymaleimides. c) The solvafluorochromism effect for three maleimides (2a-c) in various solvents. Compared to their amino-substituted counterparts, alkoxy-halo-maleimides have lower quantum yields (reduction of 20-25%), indicating the increased electron-donating capacity of the amine substituent is important for fluorescence intensity. Furthermore, the slight decrease in the emission wavelengths of alkoxy-halo-maleimides (458-465 nm) gives them blue fluorescent emissions. Amino-thio-maleimides, with greater electron-donating capacity than both the amino and alkoxy analogues, have increased emission wavelengths (526-564 nm), thus yellow fluorescent emissions. This study is a worthwhile read for anyone who uses fluorescent molecules in their work, those wishing to understand a little more about the practical principles of fluorescence and all those curious minds who like to form their own hypotheses. Yujie Xie, Jonathan T. Husband, Miquel Torrent-Sucarrat, Huan Yang, Weisheng Liu, Rachel K. O’Reilly. A group of researchers based in Valencia, Spain, have developed an enantio- and diastereoselective method to synthesize oxazolines, using a combination of silver and an organocatalyst that is only one degree of separation away from a classic British cocktail (to get that one, you might have to keep reading). This method complements the current literature by employing unactivated ketone substrates to prepare products with two adjacent chiral centres, one of which is quaternary. Oxazolines are a versatile functional group, found in synthetic precursors and functional molecules and materials. They are a common structural feature in many natural products and in medicinal chemistry they are incorporated into synthetic drug candidates as bioisosteres of other functional groups, such as thiazoles and imidazoles. Oxazolines can also be used to prepare poly(2-alkyl/aryl-oxazoline) polymers, which have utility in biomedical fields to prepare hydrogels, nanoparticles for drug delivery and imaging, and polymer-protein conjugates. In an organic synthesis laboratory oxazolines are encountered as ligands in asymmetric catalysis, such as the bis(oxazoline) ‘BOX’ family of compounds. 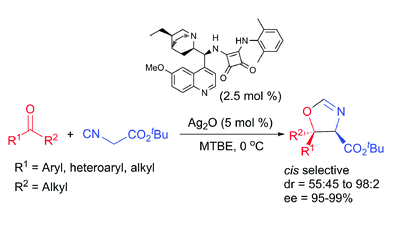 Synthesis of oxazolines from ketones and isocyanaoacetate esters via a formal [3+2] cycloaddition reaction. The researchers optimised the reaction with acetophenone and tert-butyl isocyanoacetate, and found that Ag2O (2.5 mol%) and a dihydroquinine squaramide organocatalyst (5 mol%) promoted the reaction to obtain a quantitative yield of the cis-oxazoline (80:20 cis/trans) in 24 hours with excellent enantiomeric excess (99/93% e.e.). The researchers tested the reaction scope and found that acetophenone derivatives substituted with electron-withdrawing and donating groups (NO2, Cl, Br, Me) gave the cis-oxazoline products in reliable yields (60 – 99%), fair to good diastereoselectivity (56:44 – 95:5 cis/trans) and excellent enantioselectivities (91 – 99% e.e.). Other examples tested included cyclohexanone, 2-acetylthiophene, deoxybenzoin and acetone as well as aliphatic ketones with a combination of methyl, isopropyl and cyclopropyl groups (63-99% yield, 45:55 – 98:2 cis/trans, 56 – 98% e.e.). Diagram showing the triple activation of substrates using a dihydroquinine squaramide organocatalyst combined with a silver lewis acid. The dihydroquinine squaramide organocatalyst used is a composite structure comprising a rigid cyclobutendione ‘squaramide’ and a reduced quinine analogue. The former makes strong hydrogen bonds with carbonyl derivatives while the latter confers chirality on the catalyst and has a Brønsted basic quinuclidine moiety. Quinine is an alkaloid isolated from the cinchona plant, and is the same stuff in anti-malarial tonic that is better washed down with a measure of gin. The reaction proceeds via silver-coordination to the terminal carbon of the isocyanate, accelerating deprotonation of the alpha protons by the quinuclidine base and forming a nucleophilic enoate. The electrophilicity of the ketone is enhanced by the formation of two hydrogen bonds with the N-H bonds of the squaramide, shaping a doubly activated system which rapidly undergoes a formal [3+2] cycloaddition to give the products. At first glance this seems to be a simple and straightforward transformation, but in reality the authors have succeeded in optimising a reaction for unactivated substrates which has stereocontrol over two chiral centres, one of which is quaternary. Furthermore, the reaction uses a combination of two catalysts reacting via three modes of activation. Pablo Martínez-Pardo, Gonzalo Blay, M. Carmen Muñoz, José R. Pedro, Amparo Sanz-Marco and Carlos Vila. “What are the possibilities of small but movable machines? They may or may not be useful, but they surely would be fun to make”. In December 1959 Richard Feynman addressed the annual meeting of the American Physical Society at Caltech with a talk entitled ‘There’s Plenty of Room at the Bottom’, imploring the scientific community to start thinking small, like ‘entire 24 volumes of the Encyclopaedia Britannica on the head of a pin’ kind of small. Many quote this lecture as when the notion of nanomachines first entered the scientific sphere – with talk of miniature cars, injectable molecular ‘surgeons’ and machines that place atoms side by side to synthesize any molecule imaginable. The lecture reads like the description of the futuristic setting in ‘Back to the Future’, an exploration of possibilities at a time when we fundamentally lacked the tools to make them a reality. As in ‘Back to the Future’, which predated yet predicted the emergence of mobile-banking technology, video calling and personal drones, Richard Feynman’s plea for scientists to prepare molecular-scale machines has also become a reality, and for their successes in this field Jean-Pierre Sauvage, Sir Fraser Stoddart and Ben Feringa were jointly awarded the Nobel Prize in Chemistry in 2016. A group of researchers based in London and Singapore have written a feature article introducing both the foundational work in this field and state-of-the-art examples. Nanomachines are single molecules or molecular assemblies on the nanoscale (this review defines a 1 – 100 nm scope) that have the ability to perform ‘useful work’ upon application of an external energy source. To extract work (often in the form of controlled mechanical movement) molecular machines are designed to operate at a thermodynamically far-from-equilibrium state, maintained by an energy input, with movement occurring as the system relaxes towards equilibrium. At the synthetic level, molecules are designed with components which have restricted translational and rotational movements with respect to each other, and the ability to control these movements is key to obtaining the desired function. One of the first advances towards the synthesis of nanomachines was by the research group of Jean-Pierre Sauvage, who achieved the templated synthesis of catenanes; structures with two circular molecules that are interlocked like two links in a chain. It was subsequently shown that a catenane motor could be prepared, with one ring rotating with respect to the other in a controlled manner. Fraser Stoddart further contributed to the field with ‘rotaxanes’, composite molecules comprising a ring threaded onto an axle. Nanomachines based on rotaxanes have been developed and include switches, shuttles and ‘molecular elevators’. A state-of-the-art example of a catalytically active rotaxane synthesised by Nolte and co-workers in 2003 demonstrates the potential of nanomachines to revolutionise organic synthesis. The rotaxane is constructed with a magnesium-bound porphyrin, which threads onto a polybutadiene polymer (300 kDa, 98% cis) and catalyses the epoxidation of the double bonds (turnover number: 140, cis/trans ratio of the polyepoxide: 1:4). In 2011 Ben Feringa and co-workers synthesized the worlds tiniest electric car using the same design principles they had used to create a spinning motor in 1999. The car is a single molecule with the ability to propel itself across a crystalline copper surface upon activation by a voltage pulse, with 10 pulses moving the car 6 nm across the surface. The car itself is comprised of a central diyne strut bonded at each end to carbazole ‘axles’. Each axle is bound through alkenes to two fluorene ‘wheels’. The key design elements are the alkenes and two chiral methyl substituents on each axle which forces each wheel to twist out of the plane. For one wheel rotation: an electronic excitation induces trans–cis isomerisation of the alkene causing a quarter turn of the wheel such that it sits adjacent to the methyl group. Next, a vibrational excitation induces helical inversion, allowing the wheel to push past the methyl group another quarter turn. Another isomerisation and helical inversion completes a full rotation. Research achievements like these demonstrate mechanical work on the nanoscale, with the vision of achieving movement on the macroscale via synchronised motion. These examples represent a small subset of those discussed in the feature article review, which not only spans the current scope of molecular-scale machines, but reviews the design principles guiding their development and the possibilities nanomachines represent in the future of scientific research. Elizabeth Ellis, Suresh Moorthy, Weng-I Katherine Chio and Tung-Chun Lee. Sometimes it feels as though the pinnacle of synthetic achievement is represented by 20 step total syntheses (with 10 contiguous stereocentres and 5 fused rings…). The level of chemical complexity that can be fashioned from simple building blocks is undoubtedly impressive, but amid such feats it is important not to lose sight of the elegance and worth of simple chemistry, especially when it aims to play a part in resolving profound challenges. One such challenge, which will increasingly confront future generations, is how to reduce the load of carbon dioxide in the atmosphere. One solution is to ‘fix’ carbon dioxide by integrating it into chemical building blocks of added complexity in a sustainable way. The porosity and high surface area of metal organic frameworks (MOFs), a class of three-dimensional coordination networks, proffers them as ideal materials for capture and storage of carbon dioxide. A team of researchers have designed a MOF which consumes carbon dioxide in a different way: by transformation into value-added chemicals. The group have developed a catalytic MOF embedded with lewis-acidic copper centres capable of converting aziridines to oxazolidinones by the addition of carbon dioxide. Oxazolidinones are used as auxiliaries in chiral synthesis, and are structural components of some antibiotics. The MOF, termed MMPF-10, is a metal-metalloporphyrin framework constructed from a copper-bound porphyrin ring chemically modified to incorporate 8 benzoic acid moieties, generating an octatopic ligand. These carboxylic acids groups form a second complex with copper in situ, termed a ‘paddlewheel’ for its appearance, with the formula [Cu2(CO2)4]. The resulting network contains hexagonal channels measuring 25.6 x 15.6 Å flanked by four of each of the two copper complexes. With 0.625 % of the catalyst at room temperature, 1 bar CO2 pressure, and in a solvent free environment, MMPF-10 catalyses the transformation of 1-methyl-2-phenylaziridine to yield 63% of the product. Topology of MMPF-10 showing hexagonal channels in a) and c), and pentagonal cavities in b). Turquoise: copper, red: oxygen, grey: carbon, blue: nitrogen. This work, a simple reaction to prepare oxazolidinones, shows that carbon dioxide can be fixed in specialised synthetic building blocks in a sustainable way. This is the way the first paragraph ended, ‘in a sustainable way’, because the challenge of developing such a reaction is two-fold: it must use carbon dioxide, and the reaction conditions must be sustainable. There will be no beneficial offset if the reaction uses a lot of energy, requires many resources, or generates larges quantities of waste. In this reaction the researchers have remained mindful of developing a mild, solvent-free reaction with low catalyst loading employing an earth abundant metal, reflecting an earnest aim to develop practical and sustainable chemistry. We are excited to welcome new Associate Editor Sandeep Verma (Indian Institute of Technology Kanpur) to the ChemComm Editorial Board. 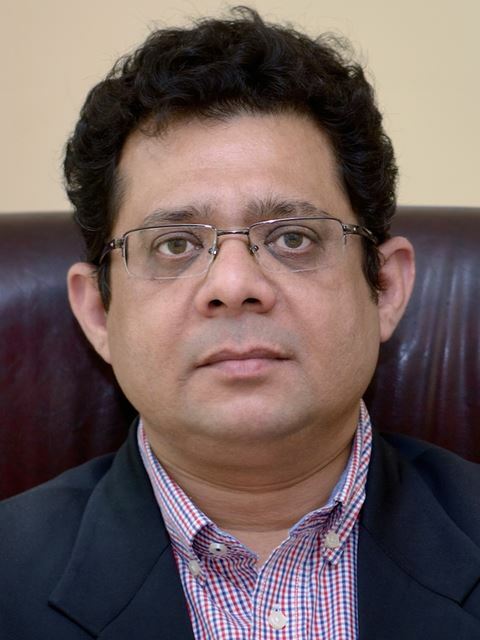 Sandeep Verma holds the positions of Professor of Chemistry and Shri Deva Raj Endowed Chair Professor at the Department of Chemistry, Indian Institute of Technology Kanpur, which he joined in 1997. His work has been recognized by numerous awards such as Swarnajayanti Fellowship (2005), Shanti Swarup Bhatnagar Prize in Chemical Sciences (2010), Department of Atomic Energy-Science Research Council Outstanding Investigator Award (2012), Ranbaxy Research Award in Pharmaceutical Sciences (2013), J C Bose National Fellowship (2013), Silver Medal, Chemical Research Society of India (2017), and National Prize for Research on Interfaces between Chemistry and Biology (2017). His main research interests include peptide/protein assemblies for disease modeling, soft biomaterials, bioimaging, and surface chemistry of metal complexes. In particular, his group focuses on heterogeneous catalysts designed by developing polymeric templates based on nucleobase frameworks for application to interesting chemical and biochemical reactions. His work also focuses on the construction of architectures mimicking biological assemblies and metal-organic frameworks. As a ChemComm, Sandeep will be handling submissions to the journal in the above areas. Why not submit your next paper to his Editorial Office? One challenge that today’s chemists face is making large-scale processes more economical and environmentally friendly. Within this area, there has been a surge of interest in the development of bioinspired catalytic systems which, relative to traditional catalysis, have the potential to reduce chemical waste by 85% by performing efficient reactions in pure water. Prof. Normand Voyer and coworkers from Laval University have recently published an eco-friendly methodology for the preparation of chiral a,b-epoxyketones in pure water using the supramolecular catalyst, homo-oligopeptide poly-L-leucine (PLL). Achieving enantioselectivity in organic reactions carried out in water poses challenges but peptide derived catalysts have shown great promise in this regard. The best example of this is the Juliá-Colonna epoxidation which has been studied and improved since its discovery in the early 1980’s. While significant progress in this area has been made, most transformations using natural homo-oligopeptides have required the use of an organic co-solvent to improve reaction efficiency. Professor Voyer shows the new, eco-friendly process begins with several homo-oligopeptides being synthesised from their corresponding amino acid N-carboxyanhydrides and used to catalyse the Juliá-Colonna epoxidation of an electron deficient olefin in water. Of all the catalysts, PLL provided the highest conversion and enantioselectivity (Table) however, the generality of the reaction appeared to be dependent on the sterics and electronics of the substrates. Computational analysis was used to model the PLL supramolecular catalyst and rationalise the observed reaction trends. PLL adopts a helical conformation with hydrophobic grooves distributed along the helical axis. When modelled with substrate 1 (Table), it was observed that the chalcone moiety fits perfectly within the PLL groove and forms a stable complex. It is this complexation that also aids in solubility of the ketone, removing the need for an organic co-solvent. Epoxidation is proposed to take place through a “groove sliding” mechanism, where the substrate slides into the hydrophobic pocket generated by the leucine side chains until it reaches the N-terminal of PLL where a hydroperoxide anion is waiting (Figure). This mechanistic proposal lends to the enantioselectivity of the reaction and explains the observed electronic and steric constraints. While the scope of PLL remains limited, this study underscores the fact that conformation and the hydrophobic nature of the oligopeptide catalysts are critical for carrying out environmentally benign organic reactions and has set a precedent for the development of future biomimetic supramolecular catalysts. Victoria Corless is currently completing her Ph.D. in organic chemistry with Prof. Andrei Yudin at The University of Toronto. 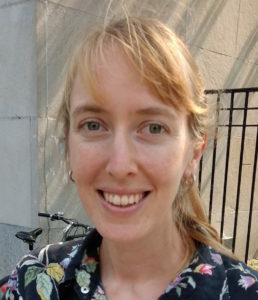 Her research is centred on the synthesis of kinetically amphoteric molecules which offer a versatile platform for the development of chemoselective transformations with particular emphasis on creating novel biologically active molecules. Poly(ionic liquid)s, or PILs, are polyelectrolytes whose potential uses are being investigated for a variety of technologies, such as batteries, membranes, solar cells and switchable surfaces. In this ChemComm communication, Professor Eric Drockenmuller and co-workers at the Université de Lyon, University of Liège and the Institut Universitaire de France describe a new family of PILs based on poly(vinyl ester 1,2,3-triazolium)s, which should give rise to new properties and application possibilities. The materials are prepared from a multistep route making use of `click chemistry´(copper(I) catalysed azide alkyne Huisgen cycloaddition reaction), palladium catalyzed vinyl group exchange, and cobalt mediated radical polymerisation. This route yields a neutral polymer, which is transformed into the poly(ionic liquid) using N-methyl bis[(trifluoromethyl)sulfonyl]imide. This useful reagent alkylates the triazole group present, and delivers the bis[(trifluoromethyl)sulfonyl]imide counterion in one step. The ionic conductivity for the PIL reported is slightly lower than for other types of PIL. To tune this property, a variety of alkynes and azides are being tested in the ring forming step of the reaction, which will result in different substituents on the triazolium ring and on the spacer group between the polymer backbone and triazolium ring. Changes in thermal properties in the the neutral precursor-to-PIL stage of the reaction were measured using broadband dielectric spectroscopy. Significant changes in solubility, and a 9⁰C rise in glass transition temperature to -16⁰C, were observed. The molecular variety introduced by this new synthetic approach offers large scope for fine tuning the electronic and mechanical material properties of these polyelectrolytes, further enabling their use in important technological applications. Researchers have made tremendous efforts to unlock stereoselective, catalytic organic transformations. In this recent ChemComm Feature Article, Professor Eric Meggers, one of the pioneers in the field of photoredox catalysis, provides a comprehensive review of the recent advances in asymmetric catalysis driven by visible light. Asymmetric catalysis has been one of the most attractive yet challenging areas of organic chemistry for the synthesis of unique, biologically active natural products such as Taxol, Rapamycin, or Vinblastine that possess numerous stereocenters. Recently, visible light, a sustainable and affordable energy resource, gained substantial interest with its capability to selectively access chiral molecules from prochiral substrates without undesirable by-products. Transformations including aldehyde α-functionalization and [2+2] cycloadditions demonstrate the potential of visible light in the presence of a photosensitizer. These photosensitizers are typically ruthenium or iridium complexes that can facilitate electron/energy transfer upon photoinduction. In most cases, a photoredox catalyst has to be coupled with a chiral co-catalyst to introduce stereocenters in the products. Notable advances in the Meggers, Melchiorre, and MacMillan research groups have recently demonstrated that photoactivation can be achieved with a single chiral photosensitizer to provide products of high enantiomeric excess and good yield. This inspirational review was just published in Chemical Communications as a Feature Article. I recommend reading “Asymmetric catalysis activated by visible light” (DOI: 10.1039/c4cc09268f) by Professor Eric Meggers to learn more about the recent advances with mechanistic details and his forecast for one of the rapidly-growing research topics in organic chemistry. Dr. Tezcan Guney is a guest web writer for Chemical Communications. Dr. Guney received his Ph.D. from the Department of Chemistry at Iowa State University with Prof. George Kraus, where he focused on the synthesis of biologically active polycyclic natural products and multifunctional imaging probes. Currently, he is a postdoctoral research scholar at the Memorial Sloan-Kettering Cancer Center in New York with Prof. Derek Tan, contributing to the efforts to access biologically active small molecules using the diversity-oriented synthetic approach. Since its structural realisation in 1985, C60 has garnered much attention in the chemical world for not only its spherical shape, but also its stability, electronic properties and the ability to do chemistry on its surface. One such avenue that has proven popular in recent times is the incorporation of C60 into one-, two- and three-dimensional arrays, either covalently or non-covalently, in attempts to control the distribution of the molecules in the solid- or solution-phase. One problem that arises in the synthesis of these extended frameworks, however, is that there often a large amount of disorder and void space in the structure, so it can be difficult to ascertain with much degree of certainty how these C60 molecules are oriented. This uncertainty can consequentially result in the properties and behaviours of the new materials remaining unidentified. Now, researchers from the University of California, Davis – Marilyn Olmstead and Alan Balch – have shown that coordination chemistry can be used to not only generate polymers that covalently link molecules of functionalised C60 in such a manner that can they can be studied crystallographically, but also that these polymers can be used to capture free C60 and C70. Initially, polymers of C60 were synthesised through the mono-functionalisation of C60 with a piperazyl group, which, on account of its two tertiary amines, can coordinate in a linear fashion with transition metal ions, in this case rhodium(II) acetate. Upon the combination of these two components, a linear one-dimensional polymer was formed, in which it could be seen crystallographically that the C60 moieties were positioned on alternating sides of the polymer chain. These polymer chains were further found to extend into two dimensions through the interdigitation of neighbouring chains in a zipper-like fashion. Perhaps more interestingly is that when these polymer chains were synthesised in the presence of either C60 or C70, free molecules of C60 or C70 were seen to occupy the void spaces between the C60 molecules of the polymer. Additionally, if a mixture of C60 and C70 was present in the polymer synthesis, it was observed that only C60 was captured by the polymer, most likely as a result of a better geometric match between the polymer and the spherical C60 in preference to the more elongated shape of C70. This work elegantly demonstrates the generation of not only a self-assembling C60-containing polymer that can be characterised structurally in the solid state, but of one that can entrap free molecules of C60 selectively over molecules of C70. Based on the properties of free C60 and transition metal complexes, the electronic and chromophoric properties of such a crystalline system could also be expected to offer some noteworthy results. Read this HOT ChemComm article in full! Chem. Commun., 2014, Advance Article. 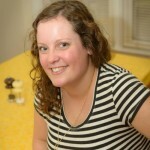 Anthea Blackburn is a guest web writer for Chemical Communications. Anthea is a graduate student hailing from New Zealand, studying at Northwestern University in the US under the tutelage of Prof. Fraser Stoddart (a Scot), where she is exploiting supramolecular chemistry to develop multidimensional systems and study the emergent properties that arise in these superstructures. When time and money allow, she is ambitiously attempting to visit all 50 US states before graduation. The synthesis of tailor-made peptide chains represents a powerful tool for tuning the structure and properties of peptides, allowing for the development of analogues for medical, technological and synthetic purposes. For example, the β-peptide is a synthetic peptide, which, in contrast to its naturally-occurring α-peptide analogue, is bonded through the β-carbon rather than the α-carbon. As a result of this seemingly small structural change, alterations in the peptide’s secondary structure and thermodynamic stability are observed. Adding fluoride groups to peptide chains represents another way to alter and stabilise the folding structure through the presence of stronger hydrogen bonds and the introduction of fluorophilicity. This approach is generally employed for the addition of fluoride groups at ‘remote positions,’ spaced two or more methylene units from the peptide backbone. However, this method has less of an effect on the conformation of the peptide itself, and instead primarily influences the tertiary and quaternary self-aggregation of peptide chains, as a result of the fluorophilic effect of the functionalised peptide chains. Much less commonly studied is the effect of incorporating fluorine groups in ‘direct proximity’ to the peptide chain, that is, directly attached to the β-carbon, where it is proposed that the intramolecular hydrogen bonding will be directly affected, and consequently, so too will the secondary structure of the peptide chain. Yasuhiro Ishida and co-workers from the RIKEN Center for Emergent Matter Science have shown that this ‘direct’ fluorination of β-peptides can, in fact, affect the higher order structures of these peptide chains. Specifically, a hexameric β-peptide was designed, which consisted of cyclohexane-based β-amino acids in the 1-,3-,4- and 6-positions and L-alanine derivatives in the 2- and 5-positions, where the L-alanine methyl groups were either native or perfluorinated. Irrespective of the degree of perfluorination in the β-peptide, it was found that the chains were arranged in the same left-handed 14-helix structure, with the NH-amide of the second and fifth residues participating in stabilising intramolecular H-bonding interactions. Moreover, it was found that although the presence of fluoride groups did not noticeably alter the overall secondary structure of the β-peptide chains, the stability of these structures was dramatically enhanced, showing the significant effect that fluoride groups can have on the hydrogen-bond donating ability of NH-amides. This new approach of modifying peptide chains offers an interesting method for influencing the secondary, and higher order, structures of the compounds, as well as their kinetic and thermodynamic properties. The effect of these structural modifications offers the possibility of tuning the chemical and biological properties of these peptide chains for use in new types of antibiotics and synthetic systems. Chem. Commun., 2014, 50, 9855–9858.